Born in Paris to parents from Martinique, Terry Brival spent his childhood in Saint-Gratien, a small town in the Val d'Oise in 95 ... This is the age of 4 his mother discovered his talent on a 45 turns of Stevie Wonder entitled "I just call to say I love you", in reproducing the same voice of the star Anglo-Saxon. But the revelation was made much later in college, when Terry begins to hum "I believe I can fly", of the famous R-Kelly, in full voice to all his fellows on the play ground, all gathered around him as he never the wished ... The history of Terry Brival continues on entering of High School, where he met Yann S and Nikko (2 Wayz) during a voice exchange during the break a good morning ... He works with Yann S (an old friend) , to form the duo "Vocals Players" : a period of intensive and hard work, chaining the hearings, private singing lessons, etc ... Until the days when Terry had to opt for a break in his musical career to pursue her studies and do various training ... This was only nine years later, that they meet in March 2007 in the heart of Paris, Yann returning from Guyana and preparing his album "A Open Book" introduces Terry in the project without hesitation. 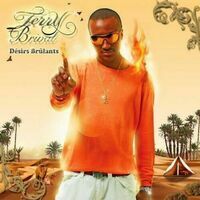 The song "Adieu" allowing Terry to accomplish his dream and finally started his singing career ... The positive feedback of the duo "Adieu" have motivated the organization to produce S'time Terry Brival. The first single is "away from you" and it send you back to addiction. Each title of his first album reference was an emotion or an event ! An album of 16 songs whose desires burn us and confronts us: Dependency (away from you) Depression (never) Love (InMe mwen) feat Scarlette Fuentes Happiness (you and me) Obsession (I t still love) Perseverance (carry on) and Bekeno feat sita Beensha Curiosity (Candy) feat Yann S Escape (ride with me) feat Aycee Jordan II Wayz Weakness (facing you) Distress (i love you) anger (my mistake) Misunderstanding (Glimmer of Hope) Indifference (Tell me) feat Eleeza.R Distance (Goodbye) .. In keeping the truth in complete silence, Terry Brival settled in his country of origin "La Martinique" where very quickly, he makes to know his music by the popular radio stations on the island .. And the opportunity to do some magazines covers to satisfy its most loyal fans. Everything goes very quickly, he returned to France where he meets the famous singer blind from the French Antilles, "Corinne Ozier" winner worthy of the issuance of voice of hope. in 2009 organized by "Espace FM" , which does not hesitate to include Terry Brival in a featuring on her album "Cocktail Dezil" (performing Steve Pierre-Louis) project planned for the end of 2010 ... This is in the greatest secret that Terry made three texts that correspond to the singer. "Not Without You, The Island Of Paradise, My Dream / A Bruised Heart" Terry will attend many social events such that wedding, baptism, Aid organizations to childhood such as World Vision France and Many others for Charity in the countries in danger. Always remaining true to radios and nightclub managers with whom he worked. Gradually Brival Terry becomes the artist that everyone "loves" his popularity reached greater heights whereas he has only two years of career. The singer reaches an audience of all ages and all cultures, he starts to attract a lot of artists in the world with his voice. Thus, Terry goes to meet SR on the French Riviera (La Côte d'Azur), being convinced of his courage and her effectiveness ... SR very familiar with the career of the artist, soon became aware of the potential of the latter, and therefore decides to become his manager without hesitation. SR will start his new job quietly. And very quickly, She became, in few months, a true businesswoman, very respected by his colleagues in the music business, and very praised for its delicacy and professionalism towards European radio stations and around the world. Contrary to what people may believe, Terry is an artist who has always remained very humble and modest, which has never loosened its big heart in front to the obstacles of life. Many of his fans await her comeback, hundreds of thousands of people remain attentive to any information. As well as a large number of producers and celebrities have need him for their personal musical projects, see more ..
That said, his new album is highly anticipated and feared by all. This biography was provided by the official representative of the artist.